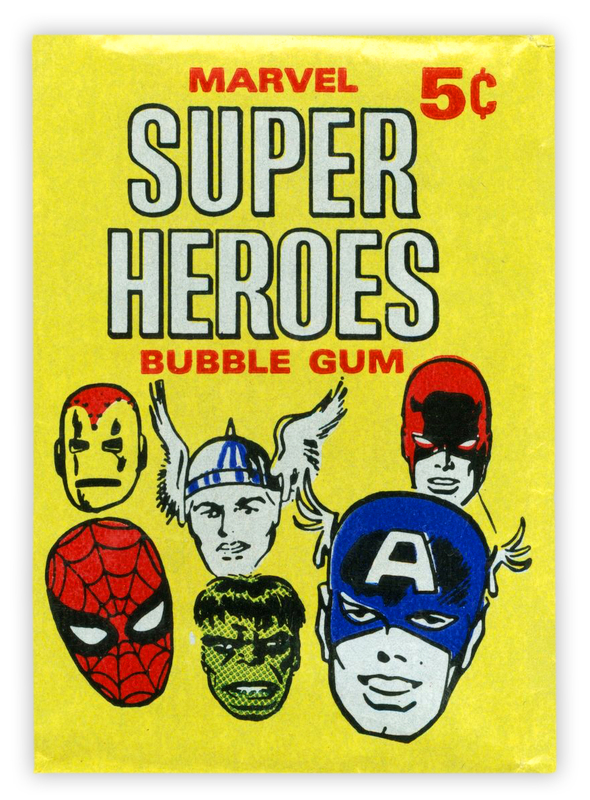 Marvel Super Heroes Bubble Gum Trading Cards by Donruss (1966) | 'TAIN'T THE MEAT… IT'S THE HUMANITY! 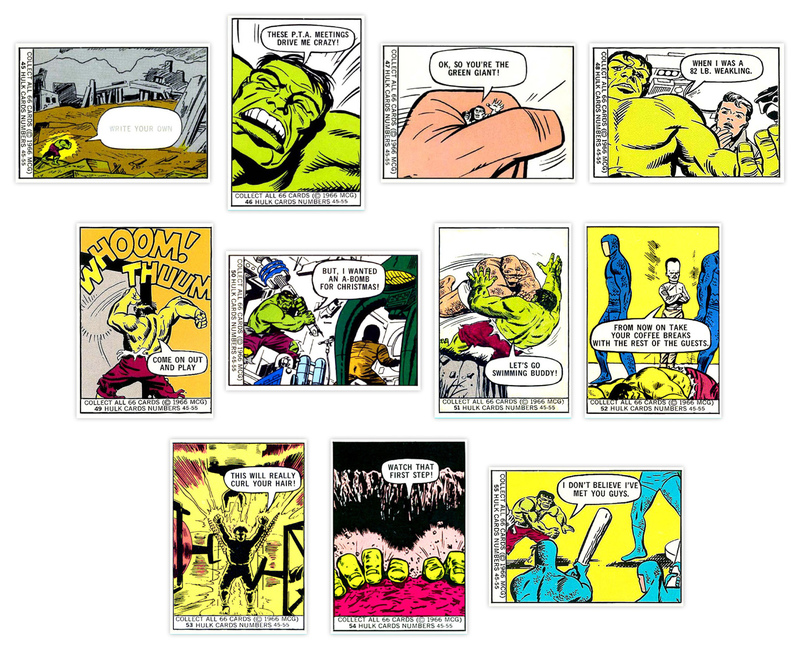 Marvel Super Heroes Bubble Gum trading cards were published to coincide with new Marvel Super Heroes cartoon show in 1966, and they marked the first time Marvel’s popular characters appeared as trading cards. Today they are much sought-after by collectors. 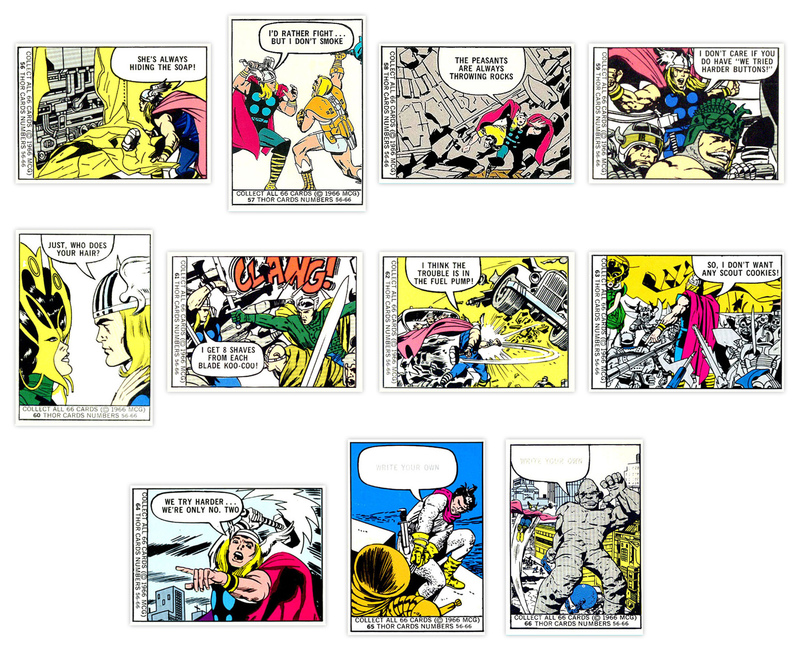 Released by trading card giant Donruss the set included 66 double-sided trading cards that featured reproductions of comic book panels on one side and part of a collage on the back. Each 5¢ pack came with five random cards and a piece of bubble gum, all wrapped in colourful wax paper. 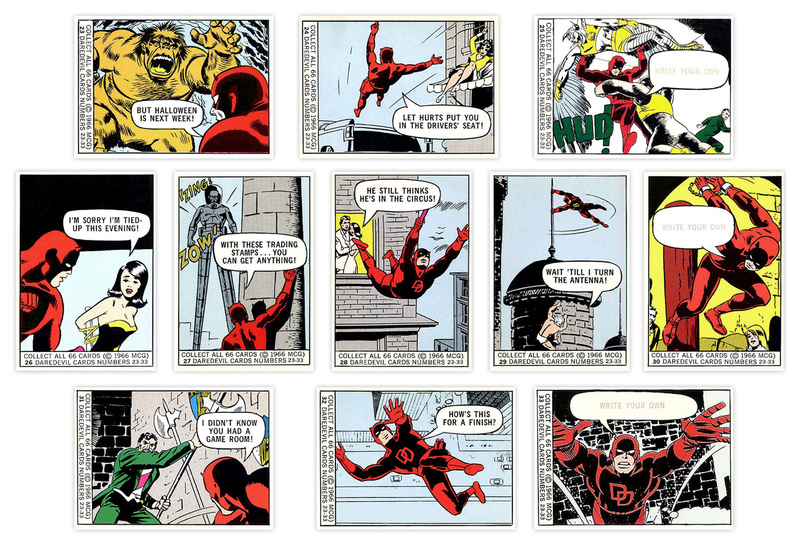 The cards were broken down into six groups of 11 cards: #1-11 featured Captain America (with artwork by Jack Kirby); #12-22 featured Daredevil (art by Wally Wood and Bobby Powell); #34-44 starred Spider-Man (art by Steve Ditko); #45-55 featured The Hulk (art by Kirby) and cards #56-66 featured The Mighty Thor (artwork by Kirby again). 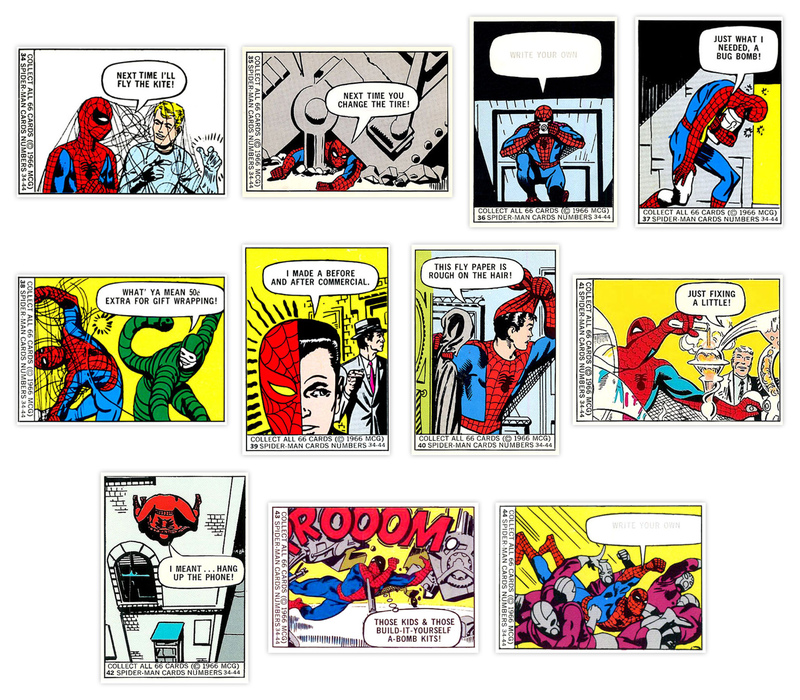 The original speech bubbles were replaced by new humorous ones (a practice continued by Topps on their Marvel Bubble Gum stickers in 1976) and on some cards kids were encouraged to write their own caption. 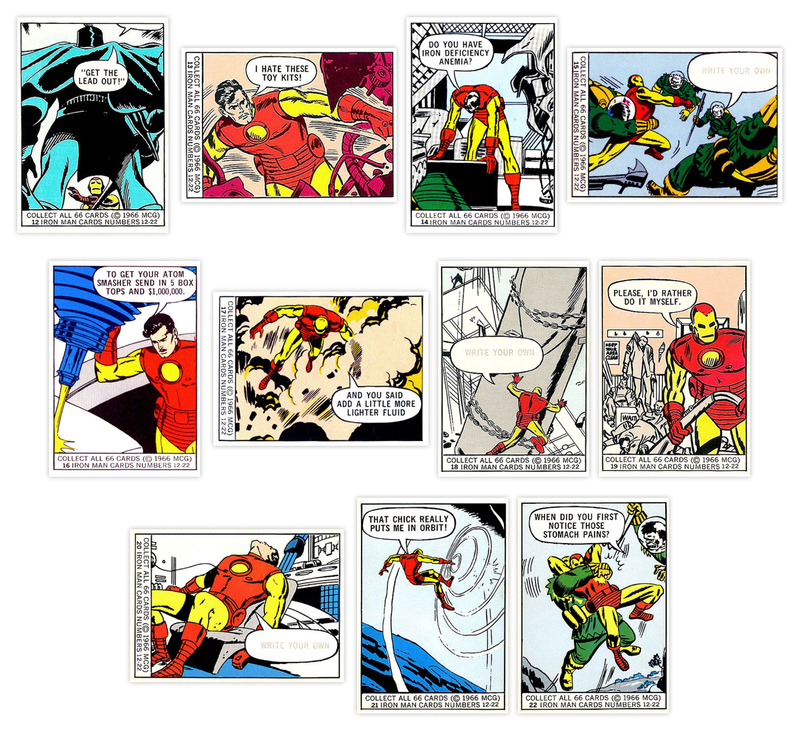 When collated the backs of the cards formed an collage of all six characters, with the same artwork appearing on the display box. I’m a big fan of these cards. 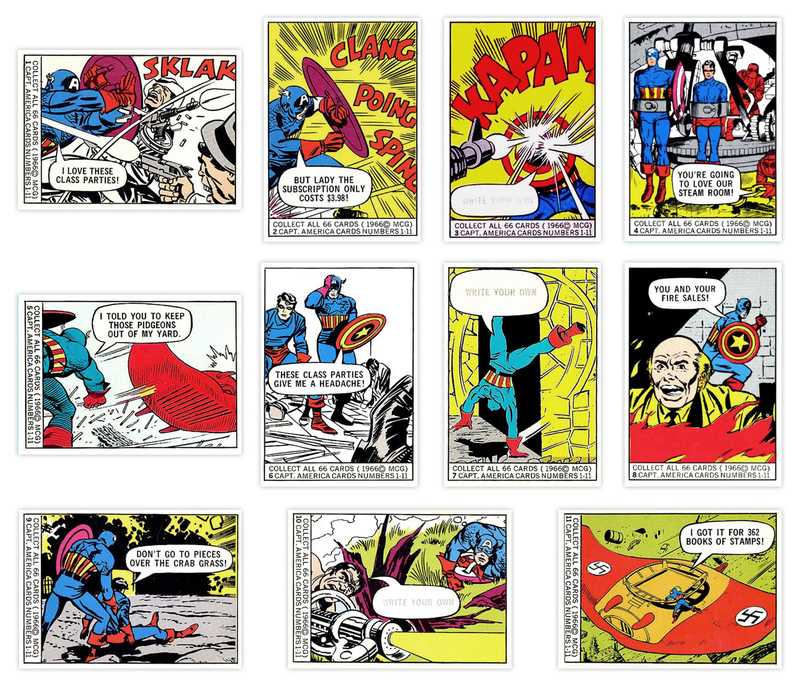 Unlike contemporary trading cards, which tend to feature specifically commissioned artwork, Donruss’ decision to reproduce panels from the original comics gives them a real pop-art feel, very reminiscent of Roy Lichtenstein’s work from the early 1960’s. The incorrect colouring doesn’t bother me either (the white parts of Cap’s uniform and shield have been replaced by yellow) — these old cards have a charm and appeal that a lot of modern trading cards just don’t have. 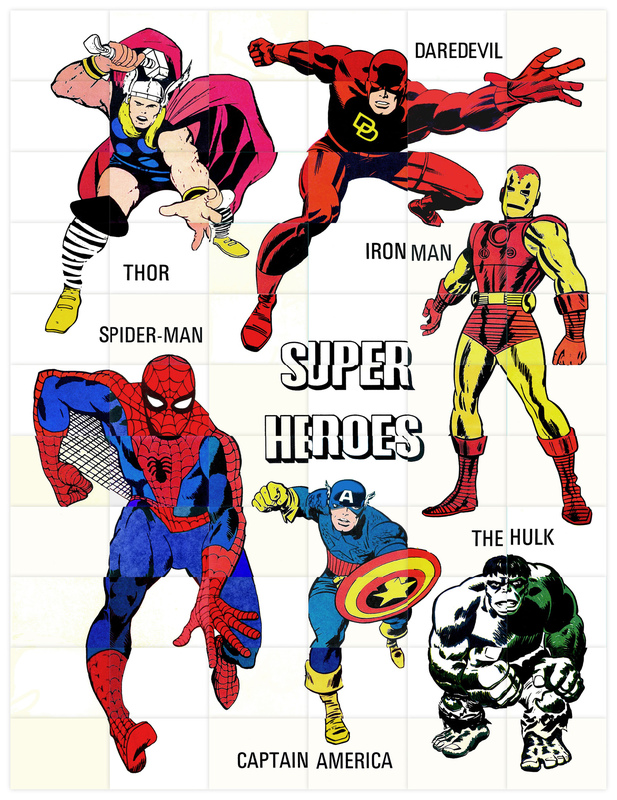 Today Donruss’ Marvel Super Heroes Bubble Gum trading cards are highly sought after by collectors (complete sets can easily fetch over $500), but collating a full set isn’t easy. The cheap repro process used to produce the cards meant that many of the cards were printed off-centre (greatly affecting their value). Also, the bubble gum inclosed in the packs wasn’t individually wrapped so any card that lay against it was frequently stained by gum grease. And asking kids to write on their own caption must have seemed like a great marketing idea as the time, but it resulted in many of the cards being ruined. So for those who don’t have $500 to spare, here are all 66 cards, both front and back.